“Kim has bought lavish items from China and other places like a seaplane for not only his own family, and also expensive musical instruments, high-quality TVs, sedans, liquor, watches and fur as gifts for the elites who prop up his regime,” opposition lawmaker Yoon Sang-hyun said in a statement. Last year, North Korea spent at least $640 million on luxury goods from China, according to Yoon. China does not provide breakdowns of its customs figures. Yoon compiled data based on a list of banned items crafted by Seoul in line with a 2009 U.N. resolution. Beijing’s customs agency did not immediately respond to a request for comment. Beijing has said it strictly abides by international sanctions against North Korea. The 2017 luxury trade volume was down from the 2014 peak of $800 million, but was only a 3.8 percent drop from $666.4 million in 2016, according to Yoon. The luxury items accounted for 17.8 percent of North Korea’s entire imports from China last year which totaled $3.7 billion, Yoon said. Purchases of electronic products such as high-end TVs made up for more than half of the total transactions, worth $340 million, followed by cars with $204 million and liquors with $35 million. China’s trade with North Korea from January to August this year tumbled 57.8 percent from the year-earlier figure to $1.51 billion, China’s customs agency said last month. But Yoon’s analysis also shows North Korea funneled more than $4 billion into luxury shopping in China since Kim took power at the end of 2011. Yoon accused China of loosening enforcement of sanctions, and criticized South Korea’s recent request for U.N. and U.S. exemptions to restart inter-Korean economic cooperation. Now, none of this means that Kim Jong-un is personally swimming in a sea of handbags and TV-sets in Pyongyang. Rather, it means that North Korea – whether semi-private companies or state entities – has imported a fair amount of so-called luxury goods, despite sanctions that should prevent such imports. The term “luxury goods”, moreover, is too broad in this case and encompasses several items that wouldn’t necessarily be classified as “luxurious” by most. The wealth gap between country and city is widening. One in every four rural children is undernourished and underweight and the North has the most serious poverty issue in East Asia, the FAO said. The proportion of underweight children in rural areas is 27 percent but only 13 percent in the cities. According to Herve Verhoosel, a spokesperson for the World Food Programme (WFP), the UN agency is staring at a massive 73 per cent shortfall in funding for 2018, hurting critical programmes such as nutritional support for children. “We must not wait for diplomatic progress to alleviate the suffering of millions of people – funds are urgently needed now,” said Mr. Verhoosel. A lack of funding risks reversing small gains in nutrition for mothers and children, made over the past four years, on the back of concerted efforts by humanitarians. Limited funding has also resulted in the suspension of operations to build resilience among disaster-hit and vulnerable communities. WFP needs $15.2 million over the next five months to avoid further cuts to programmes which help feed around 650,000 women and children each month. Across the country, which is officially known as the Democratic People’s Republic of Korea (DPRK), more than 10 million people – almost 40 per cent of the population – are undernourished and in need of support, with one in five children stunted due to chronic malnutrition. The country is also vulnerable to natural disasters, such as drought and flooding, which affect agricultural production and livelihoods. So, what is really going on here? Is it accurate to say, like the headlines imply, that North Korea’s leadership is simply buying a bunch of luxury items for millions of dollars and letting children starve in the countryside? Is there a real risk that humanitarian aid can be diverted to the army, and what does this really mean? These are separate questions, but they are interrelated in the sense that they all touch upon Pyongyang’s incentives and policy choices when it comes to its humanitarian situation. International donors and organizations have become increasingly reluctant to provide funds to North Korea. Although five countries—Switzerland, Sweden, Canada, France and Russia—have responded to the UN’s request this year, there is still a funding gap of $88.1 million. Previous donors such as United Kingdom, Australia, Japan, Ireland, South Korea and others remain uncommitted. One concern frequently cited for this reluctance is that foreign aid, including critical humanitarian aid, will either be diverted to the military or fund the nuclear weapons and missile programs or take pressure off of the regime to provide for its people. However, these concerns are based on basic misunderstandings of how and why humanitarian assistance is provided to North Korea. Facts on the ground show that the potential for diversion is minimal and the main benefactors are generally not government or military institutions. Given the mission of UN humanitarian assistance, denying the DPRK this assistance for political purposes is both unethical and inhumane. One of their most central arguments is that opportunities for diversion are too small to be meaningful. Overhead costs only make up a small percentage of total costs, and little of it could even hypothetically be diverted given that it’s all needed to run UN operations in the country. 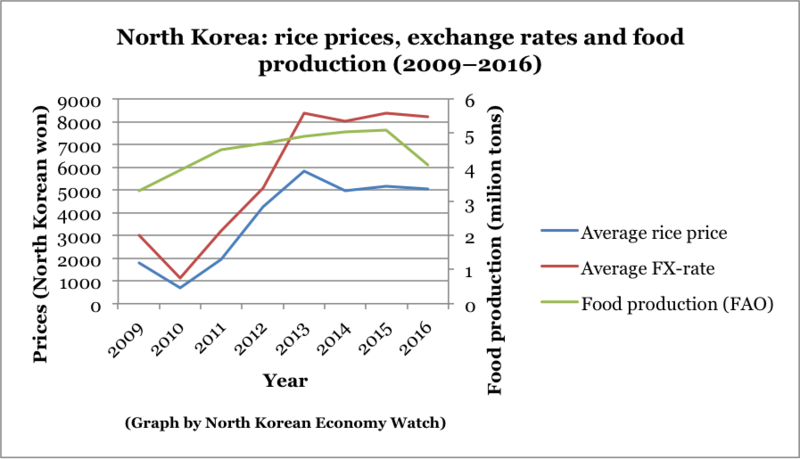 When it comes to diversion of actual food aid, the authors argue that most diversion that may occur is done towards the markets – that is, the state doesn’t actually take foodstuffs for its own use, and resources that are used elsewhere do not necessarily benefit the North Korean government. It also seems like diversion was much more of a real concern in the 1990s and early 2000s. The worry was primarily about diversion of food aid to the military and away from society’s most needy, and it wasn’t unfounded at all. But we have to assume that there’s been a great deal of learning done by NGOs and international institutions present on the ground. They know what they’re doing. Today, food aid volumes aren’t large enough to be meaningful for the army to try to divert, it seems, even if they would want to. Much of the aid, moreover, consists not of rice and other goods consumed by the general public, but likely of nutritional assistance designed to maximize the caloric intake of vulnerable groups such as children and breastfeeding mothers. We also have to remember that the chain of aid distribution and reception is long and diverse. Park and Kim argue that Pyongyang has invested much more in recent years to meet humanitarian needs. I would add that people who have worked with humanitarian aid delivery on the ground have often commented on how local officials and staff members, regardless of what one might think of Pyongyang’s intentions, are often passionate and genuine in their will and hard work to ensure that food aid reaches their local constituents and intended recipients. However, this angle misses an important point. Diversion isn’t just about the army grabbing bags of rice intended for malnourished children, it’s also, arguably, about resources in the bigger picture. At the end of the day, for the North Korean regime, feeding the most vulnerable is a matter of priority. We know it could, should it choose to do so. Even in years when North Korean harvests have likely been lower than this year (which we don’t yet have figures for) given the upward trend in harvests over the past few years, the deficit left between domestic production and projected need wouldn’t have been that expensive to make up for. Enter the luxury goods. We don’t know what proportion of the $640 million represent purchases strictly made by the state, and not by individual North Koreans or private enterprises. (The lines in this realm are rarely clear-cut.) But even low-balling it and assuming that only 1/6 is bought by the government to supply Kim Jong-un’s court and patronage networks, that’s still more than what would have been required in food imports to meet the estimated needs of the population in 2012, when, again, production was probably even lower than it is today. The UN appeal of $111 million of this year is also roughly equivalent to 1/6 of North Korea’s estimated “luxury” goods import of the past year. And that’s just using luxury goods as an illustrative example. We could also look at any one of the massive infrastructure investments by Kim Jong-un and the renovations and new constructions of entire city blocks and streets in Pyongyang, or loft projects such as the Masikryong Ski Resort. The point is that North Korea surely has the funds to cover the humanitarian needs of the most vulnerable among its population, but chooses not to and instead counts on the UN to foot the bill for doing so. A form of “diversion”, if you will. This is not to argue either for or against giving humanitarian aid. That the regime makes certain policy choices seems a morally problematic argument for not funding humanitarian needs. But in the long run, especially as North Korea’s economic health improves, one has to wonder whether it’s sensible for the international community to keep paying for humanitarian needs in a country whose regime could afford to do so, but makes a different policy choice, year after year. North Korea on Thursday called for an “all-out battle” against record temperatures that threaten crops in a country already grappling with tough international sanctions over its nuclear weapons program. Similar past warnings in state media have served to drum up foreign assistance and boost domestic unity. “I think the message was a precautionary one to minimize any impact on daily life,” said Dong Yong-seung, who runs Good Farmers, a group based in Seoul, capital of neighboring South Korea, that explores farm projects with the North. But the mention of unprecedented weather, and a series of related articles, suggest the heat wave could further strain its capacity to respond to natural disasters, said Kim Young-hee, a defector from North Korea and an expert on its economy at Korea Finance Corp in Seoul. The warning comes after North Korean leader Kim Jong Un announced in April a shift in focus from nuclear programs to the economy, and held an unprecedented June summit with U.S. President Donald Trump in Singapore. Since then, the young leader has toured industrial facilities and special economic zones near the North’s border with China, a move experts saw as a bid to spur economic development nationwide. “He has been highlighting his people-loving image and priority on the economy but the reality is he doesn’t have the institutions to take a proper response to heat, other than opening underground shelters,” added Kim, the economist. Drought and floods have long been a seasonal threat in North Korea, which lacks irrigation systems and other infrastructure to ward off natural disasters. Last year, the U.N. Food and Agriculture Organisation warned of the North’s worst drought in 16 years, but late summer rains and privately produced crops helped avert acute shortages. There appear to be no immediate signs of major suffering in the North, with rice prices stable around 62 U.S. cents per kg through the year to Tuesday, a Reuters analysis of data compiled by the Daily NK website showed. The website is run by defectors who gather prices through telephone calls to traders in the North, gaining a rare glimpse into the lives of ordinary citizens. Crops are good this year because there was little flooding to disrupt the early spring planting season, said Kang Mi-jin of the Daily NK, based in Seoul. The October harvest would reveal any havoc wreaked by the weather, Kim Young-hee added. Is North Korea’s food situation really getting worse? The markets don’t think so. Since early 2016, the Food and Agriculture Organization of the UN (FAO) has been sounding the alarm bells on North Korea’s food situation. In an interview a few weeks ago with Voice of America’s Korean-language edition, FAO-official Christina Cosiet said that this years’ harvest would be the worst one in four years. One question, dealt with before by this blog, is how bad this really is. After all, the past few years seem to have been abnormally good in a long-run perspective. But another obvious question is: why do market prices in North Korea tell the opposite story about food supply? Prices for both rice and foreign currency (US-dollars) have remained remarkably stable for a situation where people should be expecting a worse-than-usual harvest. It is important to bear in mind that prices are largely seasonal and tend to increase in September and October. But unless prices somehow skyrocket in a couple of months, things do not look that bad. There seem to be two possibilities here: either official production and food supply through the public distribution system simply does not matter that much, because shortages are easily offset by private production and/or imports. Or, the FAO projections simply do not capture North Korean food production as a whole. Graph 1: Prices for rice and foreign currency, in North Korean won. Prices are expressed in averages of local prices in Pyongyang, Sinuiju and Hyesan. Data source: DailyNK market prices. 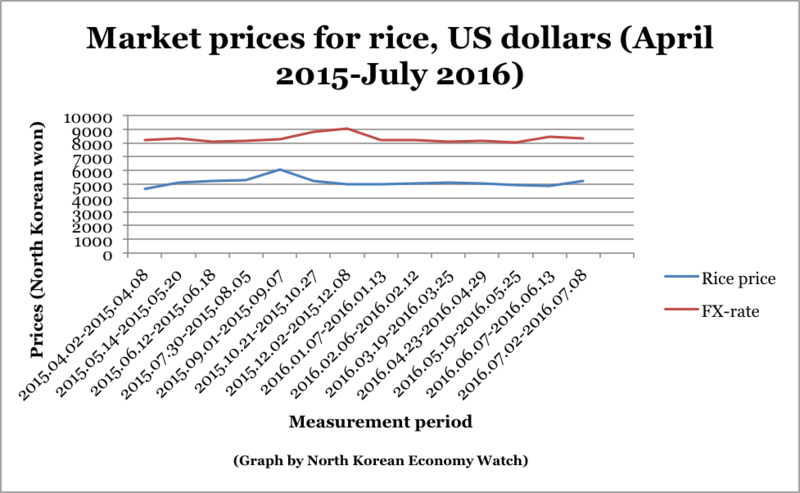 Graph 2: Prices for rice and foreign currency, April 2015–July 2016, in North Korean won. Prices are expressed in averages of local prices in Pyongyang, Sinuiju and Hyesan. Data source: DailyNK market prices. This does not look like the behavior of a nervous market where supply is declining at a drastic rate. Of course, a number of caveats are in order: again, prices are likely to rise through September and October, as they have in the past. Moreover, markets may react to any harvest declines at a later point in time, as they become more apparent. Even so, it seems inconceivable that market prices would remain so stable if North Korea was experiencing a steep dive in food production. After all, farmers would be able to see signs fairly early on, and their information would presumably spread through the market as a whole. In short, it is logically unthinkable that markets simply would not react to an unusually poor harvest. 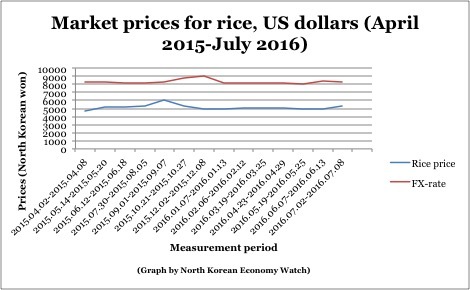 Graph 3: Yearly average market prices for rice and US-dollar (in North Korean won), and FAO food production figures. Data source: DailyNK market prices. As this graph shows, there is generally fairly little correlation between market prices and harvests as calculated by the FAO. Harvests climbed between 2009 and 2015, while market prices climbed and and flattened out from 2012, around the time of Kim Jong-il’s death. Exchange rates and rice prices unsurprisingly move in tandem, but appear little impacted by production figures as reported by the FAO. It is possible that prices react in a delayed manner to harvests, and that the price stabilization on the market is a result of increased harvests over time. But the consistent trend over several years, with prices going up as harvest figures do, is an unlikely one. Again, it is also difficult to imagine market prices not reacting relatively quickly to noticeable decreases in food production. It is difficult to draw any certain conclusions. But at the very least, these numbers suggest that the FAO food production projections are not telling the full story about overall food supply in North Korea. Moreover, market signals are telling us that food supply right now is far from as bad as the FAO’s latest claims of lowered production would have it. Rather, prices seem normal and even slightly more stabile than in some previous years with better harvests. In short, the narrative that this year’s harvest is exceptionally poor seems an unlikely one. For market prices per year, I calculated an average price from all observations in a given year. The DailyNK price data is reported for three cities separately: Pyongyang, Sinuiju and Hyesan. I have used an average of these three cities for each data observation as the base for calculating yearly averages. This is a somewhat tricky way of measuring, as the amount of data observations, as well as their timing, sometimes varies from year to year. The steep decline in 2009–2010 is primarily caused by the currency denomination, and should not be taken for a real increase in supply. The FAO food production figures are not reported by calendar year, but published in the fall and projected for the following year. Since these figures best indicate available supply for the year after they are reported, I have assigned them to the year following the reporting year. That is, the figure for 2014 comes from the WFP-estimate for 2013/2014, and so on and so forth. Russia has halted financial transactions with North Korea, and the EU has added 18 individuals and one organization to its North Korea sanctions list. The international sanctions aim to strangle the flow of hard currency into the North’s nuclear and missile programs. The Russian central bank last Thursday told all Russian banks to halt financial dealings with North Korean agencies, organizations and individuals on the UN Security Council sanctions list, Radio Free Asia reported. The order said the banks must immediately freeze bonds held by sanctions targets and close accounts related to the North’s development of nuclear weapons and missiles. A Russian presidential decree will also take effect soon to close North Korean bank branches and joint venture firms. But Russia will continue to allow financial transactions between Russian and North Korean banks authorized by the UN. The measures deal a blow to North Korea because the two countries have only recently increased cooperation. Russia has been criticized for giving the North Korean regime a lot of leeway by allowing its banks to open accounts for North Korean banks and settling business with North Korea in roubles. A recent gasoline price hike in the North seems due to Russia’s downsizing of supplies to the North. The EU has announced its third round of sanctions since the North’s latest nuclear test. This has brought the number of sanctions targets to 66 individuals and 42 organizations. They will be banned from entering EU countries and their assets will be frozen. Russia’s central bank called for a suspension of all transactions with North Korea, media outlets reported Friday, which follows Switzerland’s toughened sanctions on the regime earlier this week. The move is in line with the strongest-ever United Nations Security Council resolution adopted in early March to penalize North Korea for its fourth nuclear test and long-range missile launch and curb its weapons of mass destruction program. The Russian central bank was reported to have issued an order to local banks and financial institutions to suspend transactions with Pyongyang on Thursday, according to Radio Free Asia. The order stated that transactions with Pyongyang were possible only with the permission of the United Nations. The central bank further declared an immediate freeze on bonds held by North Korean individuals, agencies and organizations blacklisted by the UN Security Council. Likewise, Russian financial institutions will have to close any accounts that have possible links to the North’s nuclear and missile programs. On Wednesday, Switzerland imposed tighter sanctions on North Korea, ordering the freezing of assets held by North Koreans in the country and closure of their bank accounts as well as blocking funds owned by the North Korean government. The Swiss government made the move to block all funds and economic resources connected with North Korea’s nuclear and missile programs in line with UN Security Council Resolution 2270, which was adopted in March in response to Pyongyang’s nuclear test in January and a ballistic missile test in February. This included mandatory inspections of all cargo going in and out of North Korea, a ban on exports of coal, iron and other mineral resources from the North, as well as prohibiting aviation and rocket fuel exports into the country. Russia and China, two of the five permanent members of the 15-member Security Council, have generally defended Pyongyang’s stance in the council. They also negotiated some room for leeway in the March resolution on North Korea. How they implement the sanctions will be crucial to cutting the cash flow into Pyongyang’s WMD program. The Swiss government extended an existing ban on exports of luxury items to include more goods and prohibited North Koreans from studying in Switzerland in higher physics or nuclear engineering. On Thursday, the European Union expanded its sanctions against Pyongyang, adding 18 individuals and an entity it deemed related to its weapons program to its blacklist. This brings the EU blacklist to 66 individuals and 42 entities considered to be involved with North Korea’s nuclear and missile development. PYONGYANG – A ship carrying wheat donated by the Russian Federation successfully delivered its cargo in the port of Nampo today. The wheat will help the United Nations World Food Programme (WFP) to meet the nutritional needs of more than 620,000 children and women for a period of four months. “Russia takes an active part in WFP’s operations in general, and in particular in its activities in DPRK. We highly appreciate WFP’s efforts aimed at providing aid to the most vulnerable strata of the country’s population, including children and pregnant and nursing women. We know that the Koreans feel deep gratitude because of this timely and valuable help. We consider it important that Russian flour and wheat are used to produce nutritious cereals and biscuits in local factories,” said Alexander Matsegora, Russian Ambassador to the Democratic People’s Republic of Korea (DPRK). The wheat will be used in locally-produced fortified biscuits and “cereal milk blend” – a specially designed flour fortified with essential micronutrients, which is used to make pancakes or bread. “I would like to thank the Russian Government for this generous donation and its continued commitment. The Russian contribution is timely following a poor harvest after last year’s drought and comes at the end of the cold and harsh winter. WFP’s assistance is crucial to ensure young children grow into healthy adults by giving them the nutritious food they need,” said Darlene Tymo, WFP’s Representative and Country Director in DPRK. The wheat was procured by WFP thanks to a contribution of USD 4 million from the Russian Federation. In the last five years, Russia has donated a total of USD 22 million to WFP in DPRK. Almost a third of children under five in DPRK do not have enough diversity in their diet and are short for their age – a condition known as stunting. If children miss out on crucial vitamins and minerals in the first few years of their lives, it can affect long-term development and growth. WFP’s nutrition assistance helps to provide vital nutrients to children, as well as to pregnant and nursing mothers. This summer and fall has seen a somewhat contradictory stream of information about the North Korean food situation. First there were the drought warnings, which were closely followed by regime sources claiming that harvests were actually getting better thanks to agricultural reforms. During the fall, however, the picture painted by multilateral institutions like the Food and Agriculture Organization (FAO) and the World Food Program (WFP) has been one of dire and continued problems. North Korea’s staple food production could plummet by 14 percent this year because of bad weather, sparking fears of exacerbating chronic food shortages in the impoverished nation, according to the UN agricultural agency. The gloomy forecast from the Food and Agriculture Organization comes as the reclusive communist country prepares for a lavish military parade Saturday to mark the 70th anniversary of the ruling Workers’ Party. The North is expected to produce 3.7 million tonnes of rice and corn this year, down from 4.3 million tonnes last year, according to a report from the FAO early warning system. Pyongyang plans to import 500,000 tonnes of rice and corn from abroad, the FAO said, but it will not be enough to feed its 25 million people. The country, plagued by regular droughts, will face a total shortfall of 1.2 million tonnes of its staples. State media reported in early June the country’s main rice-growing areas had been badly hit by the “worst drought in 100 years”. North Korea saw significant rainfall later, but analysts said the prospects for this year were still grim. More than 26 percent of children in North Korea’s countryside are underweight, a U.N. Food and Agriculture Organization report says. The agency, in its recently released “State of Food and Agriculture 2015” report, also estimated that there are twice as many undernourished children in the communist country’s rural areas as in its cities. Andre Croppenstedt, an FAO researcher who wrote the report, told VOA that “it’s normal to have a much higher percentage of children underweight in rural areas as opposed to urban areas,” but that the gap “is perhaps a little larger than usual” in North Korea. The North Korean ratio is the 24th highest among the 123 low-income developing countries. Among East Asian countries, North Korea’s ratio ranked fifth, after East Timor, Cambodia, Papua New Guinea and Laos. The United Nations’ food agency plans to extend aid to North Korea amid reports that the communist country is facing food shortages next year. Damian Kean, a regional spokesperson for the World Food Program (WFP), told VOA this week the agency plans to extend the current food aid program for another six months. “This current program cycle is supposed to be finished this December. What we decided to do is to extend the program until the middle of next year,” said Kean. He added that the agency needs an additional $23.3 million to fund the extension. The WFP is conducting an assessment of the nutritional status of North Koreans to determine if further assistance is needed after June of next year, Kean said. The agency launched a two-year food aid program in July 2013, and it had already extended the program through the end of this year. According to Kean, the food shortages are affecting the most vulnerable groups, including young children and pregnant women. More than 30 percent of North Korean children under five are experiencing stunted growth because of malnutrition, and more than a third of pregnant women and breastfeeding women are suffering from anemia. This all suggests, as one might have expected, that North Korean claims of successful agricultural reforms may not have been the whole truth. At the very minimum, had such reforms had a strong and positive impact, harvests shouldn’t be declining compared with last year. Or harvests could just be stronger than what they would have been after the drought absent economic reforms. In any case, North Korean claims of a growing harvest do not seem to have held out. Marcus Noland at the Peterson Institute’s Witness to Transformation Blog offers an interesting theory on these numbers: they aren’t that bad when compared with output over the last decade. Last week Yonhap ran a story titled “N.K. 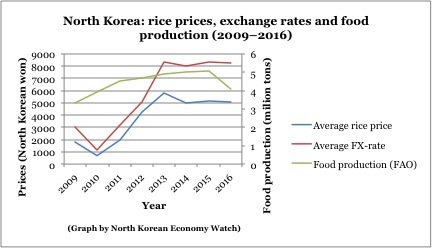 may suffer severe food shortage next year: S. Korean expert” in which Kwon Tae-jin, formerly of the Korea Rural Economics Institute and now at the GS&J Institute, argued that North Korea may be facing its greatest food shortage of the Kim Jong Un era. Numerous articles, citing reports from the UN system, have highlighted high rates of malnutrition, particularly among vulnerable groups such as children. The problem is that while the situation appears to be deteriorating relative to last year, as shown in the chart above, the FAO forecast of actual food availability per capita for 2015-16 actually represents a slight improvement over conditions for most of this decade. Detailed data from the FAO displayed in the table below confirm that while production is forecasted to decline for coarse grains, maize, and rice, only in the case of rice is output forecasted to be below the 2011-13 average, and in this case, increased imports are expected to offset most of the shortfall. Is North Korean food insecurity being hyped? What I wonder still is what this says about the progress of reforms, even if the figures aren’t particularly alarming. Also, the trend has been an increase in harvest figures over the past few years. So even if these figures aren’t particularly out of range, they still go against a trend of growth. However, the number of people working hard to ensure the success of the rice harvests on collective farms is dropping. This is in large part due to the fact that despite reassurances from the state that farmers will receive sizable allocations of the harvest for their own use, for the past several years this has not been the case. After “repeated failures by the authorities to fulfill stated promises,” he asserted, farmers have concluded that it makes no difference to them personally whether the collective farms do well or not. The U.N. food aid agency said Thursday that its aid to North Korea’s vulnerable people dropped 44 percent last month because of a lack of funds. A World Food Program spokesman said the organization in September provided 2,105 tons of food to 742,000 people who depend on external assistance, including pregnant women and children. Last month’s amount was also significantly less than what the U.N. agency planned to provide. The agency’s goal was to provide 10,000 tons of food to 1.8 million people every month. Recently, the agency scaled down distribution areas to 69 counties and cities across the country. “The main reason for distributing less food in September was insufficient funding resources,” wrote Damian Kean, WFP’s regional communications officer, in an email to VOA. To fund projects this year, the agency needs about $167.8 million, but it has secured only half of the amount so far, according to the agency’s website. The FAO has also highlighted the problem. As mentioned in another post, while the North Korean government claims success for agricultural reforms and claims that the drought impact was very limited, international aid agencies paint a different picture. But data confusion is nothing unusual for North Korea, and perhaps the picture will change as both the North Korean government and multilateral agencies continue to reassess the situation. The food aid cut came as the communist country has been reducing food rations. Last month, North Korea distributed an average of 250 grams of daily rations per person, a 21 percent decline from a three-year average, according to the U.N.’s Food and Agriculture Organization. The figure was less than half of the minimum amount recommended by the U.N. FAO officials blamed poor crop production caused by drought for the cut. Experts warn that North Korea could face further food shortages next year. “North Korea has not imported enough food this year, nor did it get significant aid,” said Kwon Tae-jin, an economic analyst in Seoul who specializes in North Korea’s agriculture. The FAO said North Korea needs 421,000 tons of food from the outside world by the end of the month to feed its citizens this year. The drought that didn’t matter, North Korea says – thanks to agricultural reform? During the past few months, the World Food Program (WFP) has made reoccurring pleas for increased food assistance to North Korea to alleviate the food shortages expected from a severe summer drought. The North Korean government made similar statements and claimed that the drought was the worst one to occur in 100 years. Aid to the country was subsequently increased from the originally planned level, due to the drought. But now, one North Korean official is saying that food production ended up increasing, after all, thanks to agricultural reforms. This is interesting for several reasons. First, the agricultural reforms seem increasingly pronounced. Though other reforms were reportedly backtracked earlier this year, the government seems eager to claim success for the road travelled in agriculture. I have written elsewhere that the data doesn’t necessarily support a claim that reforms are working. There is still reason to be skeptical – after all, a North Korean government official claiming that his government’s policies are working is not surprising – but even the claim itself is interesting. Second, the statement raises questions about monitoring and data gathering capacities, both of the regime and relief organizations in Pyongyang. Again, just a few months ago, alarm bells were ringing about a potential food shortage, and now, a regime official claims that food production has increased. What was the basis of the WFP and regime claims that a food shortage was imminent a few months ago, and what has changed since those claims were made? Thus, it seems like Pyongyang wants to encourage experimentation and diversity in production methods. This would be a potentially important step towards more efficient agriculture. Perhaps it is part of a pattern. Provinces have reportedly gotten significant leeway in setting up their respective special economic development zones, which could also be a way to encourage experimentation in policies and management methods. According to the Tongil Sinbo article, reforms are set to expand further in the country given the alleged success. Perhaps it won’t be too long before we can learn more about them through assessments by multilateral organizations like WFP. Food aid to North Korea more than doubled from June to July and over 3,000 tons were distributed to pregnant women and children, according to the World Food Program. Damian Kean said Monday the July delivery of 3,231 tons of highly nutritional food items for infants and expectant and nursing mothers is this year’s largest, Voice of America reported. In June, the World Food Program said 1,528 tons of food was sent to North Korea, and aid reached a low in February when only 1,187 tons of food reached the reclusive country. South Korean news agency Yonhap reported the July food aid package was the biggest in 19 months, but the number of aid recipients decreased from 632,000 to 620,000 between June and July. The World Food Program’s fundraising goal of $168 million – needed to provide highly nutritional food packages to 1.8 million hungry North Koreans – has only reached half, or $82.9 million, of its target number. The U.N. organization has postponed the termination of its North Korea food aid program, due to an ongoing drought in the country that is posing risks to the food supply. You are currently browsing the archives for the UN World Food Program category.